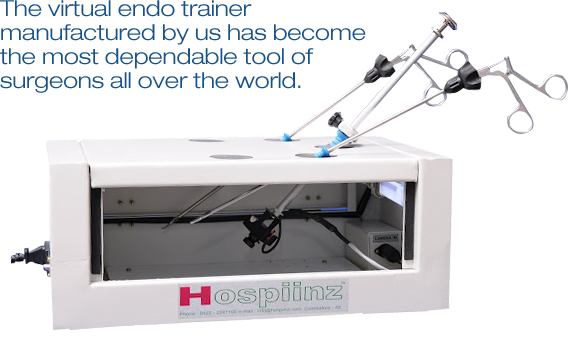 We, Hospiinz, ISO 9001-2008 and ISO 13485-2003 started our business operations in the year, 2003 as manufacturers and exporters of an advanced range of Laparoscopic Equipment & Instruments.Based on cutting edge technology our medical devices are safe for carrying out most critical of surgeries. The success our product range has achieved is due to the combination of various factors such as advanced technology used in manufacturing process, critical R&D operations, stringent quality monitoring at every stage of production. We are particularly appreciate for designing and manufacturing Virtual Endo Trainer that has a builtin high resolution camera. 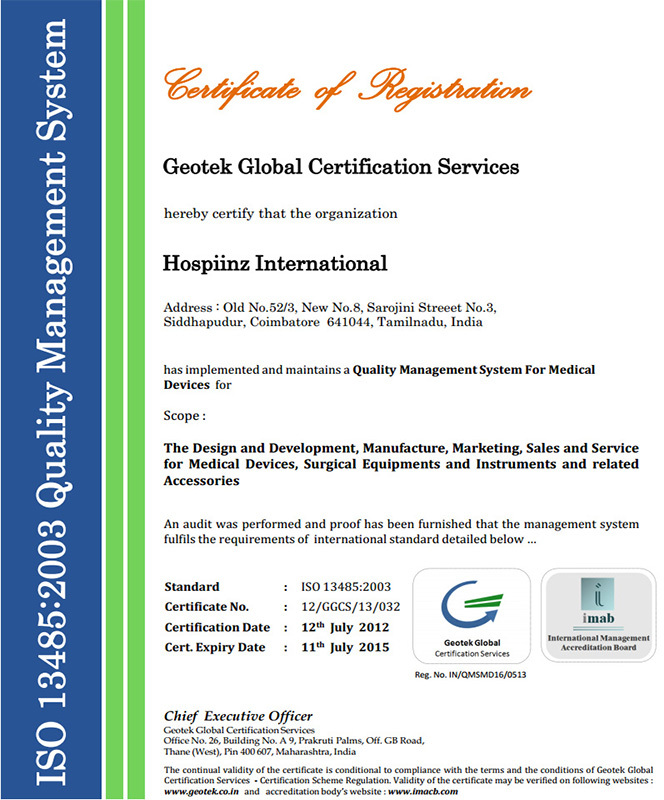 The laproscopic instruments manufactured by us find application in hospitals, medical colleges and health care centers. We have a loyal and critically appreciative clientele spread across domestic and overseas markets. Some of the countries our laproscopic instruments and virtual endo trainers are exported are U.S.A, Uk, Europe, Emirates, Asian countries. We manufacture and export one of the most efficient Virtual Endo Trainer which is one of our most significant laproscopic instruments. The innovative virtual Endo Trainer is conceptualized, designed &developed to offer high resolution picture which is as accurate as laparoscopic camera, minus the standard laparoscopic video camera, Light Source, telecope & Fiber Optic Cable.The new virtual endo trainer box is outfitted with builtin camera, light source, telescopic rod and virtual trocars. We leverage on world class technology in manufacturing these virtual endo trainers. A plastic plate with holes is provided inside the box for specimen holding. Three virtual trocars has been provided to introduce the telescope and hand instruments. The CCD Camera is mounted in one end of the Telescopic Rod which will pass through the trocar hole and in the other end of the Telescopic Rod the hand grip is mounted. Hence the Telescopic Rod will not come off or fall down. Movement arrest clamp is provided for telescopic Zoom-in and Zoom-out movement, to enable the trainee to keep the camera position as per requirment and can get trained without help of the camera person. The movement arrest clamp can be kept-off. The video output of the camera has taken through sealed cables inside the Endo trainer box and finally connected to a socket, from where the output of the camera can be taken and it can directly connect to colour Television. For illumination the pencil bulb has been built inside the Endo trainer box. All the electrical wires and other adopters are consealed, so no electrical connections left out. Compactable with video system. The connection sockets for video system is located in the rear side of the control unit. VET is available in PAL ystem. With a built in CCD camera, able to get the colour picture without our regular Laparoscopic camera. The telescopic Rod will provide the movement of the camera. One can experience the zoom in, zoom out, Left, Right, Up and Down movements. Built in pencil tube light sources eliminates regular laparoscopic light source & Fiber optic cable. Compact, ergonomic & most economic design. We have an advanced infrastructure facility that supports us in designing and developing a high quality range of Laproscopic instrumets. As manufacturers of virtual endo trainer we have receive critical appreciation from broad based clientele. Our infrastructure comprises a highly equipped manufacturing unit, quality testing and research and development divisions and warehouse and packaging facilities. Members of all units work in tandem to achieve the common goal of total client satisfactions. 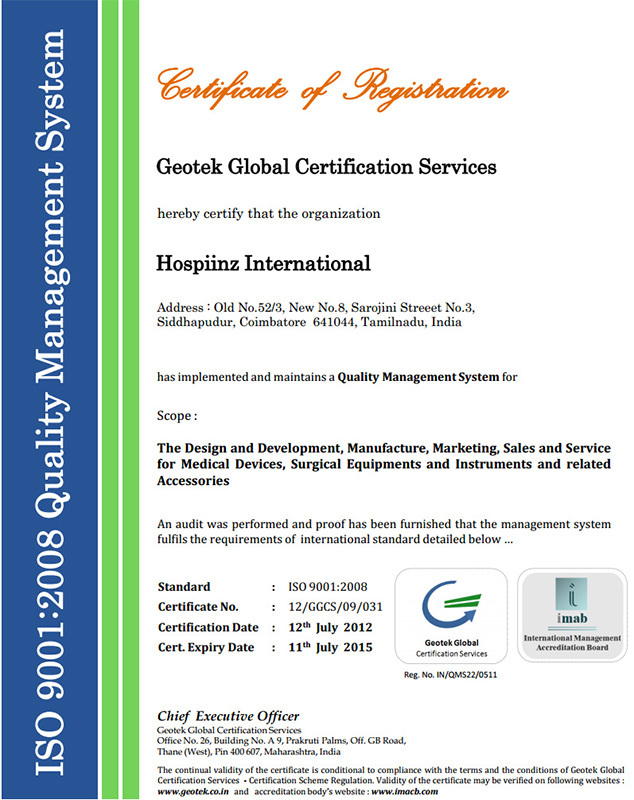 To maintain high product quality is the organizational objective that we are constantly working at. Our quality assessment starts with integrated research and development procedure, running the manufacturing process through microscopic quality monitoring for an outstanding range of laproscopic instrument comprising virtual endo trainer and other equipment.